Took her little dog in there once, Mr. Jenkins. Unfortunately, she cried and cried cause she wanted to go home with her dog. Yes, we all need hope . . . Sister continued Prayers for Connie, you and the rest of the family. Is there any way to have her help a preschool or young youth group by sorting out projects for them. I'm not sure what this means (more coffee please). She is in the nursing home. For awhile my mom had a teen come visit her. (She is in assisted living). It was a teen girl thAt would just come and talk and spend time with her. I know the teen, at one point, brought her a teddy bear that Mom still has. I'm not sure who or how this was arranged. Maybe a Girl Scout troop could "adopt" her. You could reach out to an older troop and see if this is something they could put together for you. They could come share time with her as a group or on an individual basis. And find maybe some ways to pass time with her. Our troop did this once and we even "initiated" her into our troop. Took a carved pumpkin at Halloween - sang Christmas carols at the holidays, etc. Find a creative Girl Scout leader? Maybe I should clarify huh. When I worked and we had art projects with the children. Getting activities together was time consuming. I understand she can't cut things out. But sorting out different things she could do. Like sorting out beads or scraps of different colors of paper for projects. Even used crayons by colors. Stuff like that. Just a thought. I like your thinking Caddy. How's everybody doing? Continued prayers for all in need. Miss you all. Hope everyone's doing well. Kind of bummed out. My youngest brother finely made a trip to Southern California to visit the family. There was just no way we could go at this time. But he sent a bunch of pictures. And he is having a wonderful visit with everyone. I am so happy that he was able to go. Had a very trying day. Daughter called and ask if I could burn a CD for her. Told her yes. She came over and bought a recovery program for her computer. As it wouldn't boot up and said she needed to put in her recovery disc. Which she didn't have. She found one on line and downloaded it. But guess what the computer the kids got me didn't have a dang burner in it. It plays Cds & DVD's but didn't burn. So off to the store we went and I got an external burner. Got home loaded the driver etc. Went to download the recovery program she had bought. Dang computer said it was in a zip file and had to be opened. Guess what didn't have that one the new computer either. So found on on line that Microsoft recommended. Bought that. Download it. Then was told we needed a something else to burn it on the CD. She found that and downloaded that. And after about 4 hours she got it burned on to a Cd and went home. After she got home had dinner went in to download the recovery disc. Her dang computer booted up just fine. I needed both things but what a hassle it was. thanks Caddy -- I will work on this! 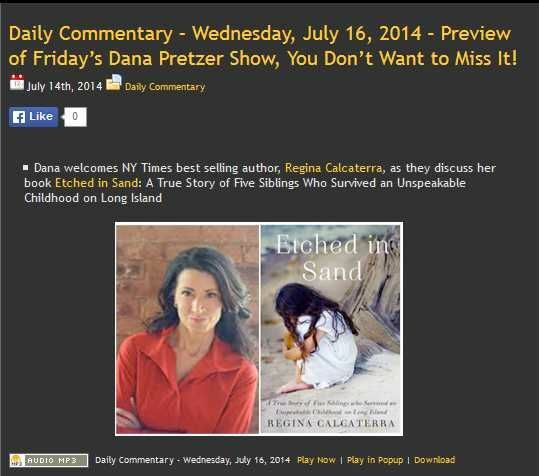 Don't Miss Tomorrow Nights Dana Pretzer Show - It will be a good one! Evening Monkeys Yikes we got some much needed rain here in North Texas. But I think some areas got a bit more than they wanted all at once. Some places got between 7 & 10 inches of rain in about 8 hours. Waiting to see what the totals will be when it's all done some time later tonight. Click on the link below at 9PM ET! Morning Monkeys Hope every ones doing well. Prayers for all in need. Still have youngest grandson here with us. Tells me he isn't ready to go home yet. Gee wonder why? Could it be grandma makes all is favorite foods and buys him all his favorite snacks. Morning Monkeys Yikes just read where there was a possible tornado in Virginia. Hope all our Monkeys in the area are safe. Hope all is well with everbody. Miss seeing so many on here and just pray everything is okay. Today is Connie's birthday. She is 55. Just wanted to thank everyone for your continued prayers and thoughts. We did well. The storms sort of split around our area - nearby got hit with branches down and trees toppled. Thanks for asking! Glad you guys didn't have any damage or any one get hurt. Page created in 6.308 seconds with 20 queries.